On page 9, figure 13, data needs to be corrected on figure. This TechBrief provides an overview of a new dynamic shear rheometer (DSR) method that is an alternative to the bending beam rheometer (BBR) to measure low-temperature rheology, including m‑value and creep stiffness. What is 4-mm DSR and Why is it Needed? Four-mm DSR is a major technological breakthrough allowing improvement in our ability to provide performance‐related specifications for highway materials. The term 4-mm DSR refers to performing low-amplitude oscillatory shear tests corrected for instrument compliance and employing 4-mm diameter parallel plates as shown in figure 1. Figure 1. Photo. Four-mm DSR. The potential testing temperature range for 4-mm DSR is from -40 to +60 °C. The actual range depends on the stiffness of the binder. For example, rolling thin film oven (RTFO)-/pressure aging vessel (PAV)-aged asphalts can typically be tested to -30 °C and in some cases to -40 °C. Whether reliable data at -40 °C can be achieved depends on the glassy modulus temperature. The glassy modulus is generally considered as 1 GPa for paving grade asphalts. On the upper end, reliable frequency sweep data can generally be obtained at 30 °C and in some cases as high as 60 °C. The key to the upper limit is sufficient binder stiffness to generate measurable torque. Because low-temperature rheology can now be reliably determined with 4-mm DSR, it is an attractive alternative to BBR. The method is currently undergoing ruggedness and round-robin testing for eventual adoption by the American Association of State and Highway Transportation Officials (AASHTO) and ASTM. The testing is being performed under the guidance of the Binder Expert Task Group. There are a number of advantages to using 4-mm DSR as an alternative to BBR. The most important advantage is probably the small amount of binder required for 4-mm DSR compared with BBR. Each BBR beam requires about 15 g, whereas 4-mm DSR only requires about 0.15 g. That means, for example, when performing an extraction to get low-temperature rheology of the recovered binder, there is a very large reduction in the amount of solvent and time to recover the binder. The same point applies to low-temperature evaporative recovery of emulsion residue. It is essentially impractical to generate enough emulsion residue for the BBR but no problem for 4‑mm DSR. Does 4-mm DSR Require Expensive New Equipment? Four-mm DSR can be performed with a rheometer as described in the apparatus section of AASHTO Test Method T315. While typical DSRs configured for T315 have a narrow temperature range, most rheometer manufacturers offer practical options to broaden the required low-temperature capability down to -40 °C asneeded for this method. How Can 4-mm DSR be Applied to Help Hot-Mix Asphalt (HMA) and Warm-Mix Asphalt (WMA) Pavement Design, Construction, and Performance? The key advantage of 4-mm DSR over BBR, as mentioned previously, is that only a very small amount of binder is required to perform a test. The small amount is highly advantageous for several reasons. When investigating HMA and WMA pavement performance and distress, the observed distress can provide clues about the failure mode, but to properly diagnose the distress or failure, it is often necessary to sample and test the existing pavement. Pavement sampling is traditionally performed by coring. In some cases, the primary interest is in characterizing the recovered asphalt. However, BBR testing requires roughly 45 to 60 g to fully characterize the low-temperature rheology. The extra time and effort and copious amounts of organic solvent to extract sufficient asphalt for BBR often limits its application. The small amount of asphalt binder required for 4-mm DSR has led to the development of micro-sampling and extraction methods. (1) Micro-sampling is a method to collect small-scale samples (less than 200 g) using a rotary hammer drill, masonry bit, and vacuum collection system. Micro-extraction refers to recovery of roughly 10 g of asphalt from 200 g of pulverized pavement. The micro-extraction process involves many of the standard extraction procedures performed under AASHTO T319 but in a simpler, small-scale manner requiring substantially less solvent. Over the last decade, the focus of research on emulsion residue recovery has been to simulate field curing, particularly for polymer-modified emulsions, because the high temperatures involved in distillation and, in some cases, oven evaporation methods can significantly affect the binder’s rheological properties. (2) Several low-temperature evaporative recovery methods have been developed, but these methods do not typically produce sufficient asphalt to perform BBR measurements. However, these low-temperature evaporative methods do generate ample material for 4-mm DSR. Thin film oxidative aging—defined here as a film of several hundred microns—resolves several current problems with the RTFO but requires a very large surface area to generate sufficient binder to use the BBR, making thin film aging impractical. However, with 4‑mm DSR, thin film aging is a feasible alternative to the RTFO. Recently, a thin film (300 μm) aging test has been developed as an alternative to standard RTFO and PAV. (3) The test method is referred to as the Universal Simple Aging Test (USAT) and reduces the test time from 85 min with the RTFO to 50 min. In addition, the long-term aging in the PAV is reduced from 20 h to 8 h.
Four-mm DSR is a simple alternative to the modified BBR proposed in AASHTO TP 87-10 for measuring low-temperature crack sealant rheology. For RTFO/PAV paving grade binders, 30 MPa is only reached well below 0 °C. But for very stiff binders from, for example, recycled asphalt shingles (RAS), 30 MPa can occur well above 0 °C. To accurately measure the intermediate-temperature rheology of RAS, the instrument compliance must be corrected. In other words, when the true shear strain applied is significantly lower than the command strain because the sample/geometry configuration is stiff compared with the instrument, the test fixtures and the torque transducer are also deformed by the stress required to shear the sample. The deformation of the test fixtures and transducer constitutes the instrument compliance. (7) Significant error in the reported mechanical properties may result if the compliance is not properly taken into account. The effect of the compliance correction is demonstrated in figure 2. At low frequency (high temperature), the asphalt binder is compliant, and the effect of instrument compliance is negligible. However, at high frequency (low temperature), the asphalt binder is no longer compliant, and the effect of instrument compliance is significant. 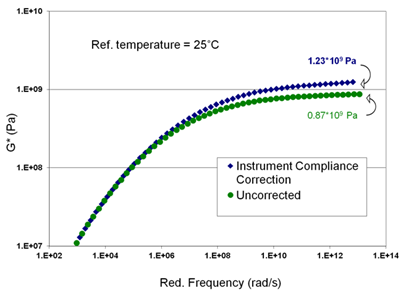 Instrument compliance correction adjusts the DSR measurements to reveal the true low-temperature rheology. Figure 2. Graph. Four-mm DSR—aged asphalt binder and complex shear modulus master curves from corrected and uncorrected data. Figure 3. Equation. Shear modulus. Figure 4. Equation. Measured strain. In figure 3 and figure 4, G is the modulus, τ is the stress, and γ is the strain. At high temperatures (i.e., temperatures well above the glass transition of the sample), the modulus is low and is much less than that of the instrument or measuring tool (stainless steel or aluminum). The deformation due to the machine compliance, or the second term in the right-hand side of figure 4, is negligible. Consequently, the measured modulus is the actual modulus of tested material. However, at low temperatures or temperatures close to and below the glass transition temperature of the sample, the modulus begins to approach that of the instrument or measuring tool. In this case, the compliance from the instrument (second term on the right-hand side of figure 4) is not negligible. As a result, the measured modulus of the sample is lower than its true value, which can lead to an error factor of approximately 10 in the estimation of the glassy shear modulus. Instrument compliance is determined by varying the angular motor displacement and measuring the torque generated using a solid rod in place of parallel plates. This issue of measuring the instrument compliance has been discussed with the major rheometer manufacturers. It is anticipated that in the near future, the rheometer manufacturers will measure the instrument compliance before delivering a new rheometer and will, as part of the annual maintenance, measure the instrument compliance for the client on older instruments. Figure 5. Graph. 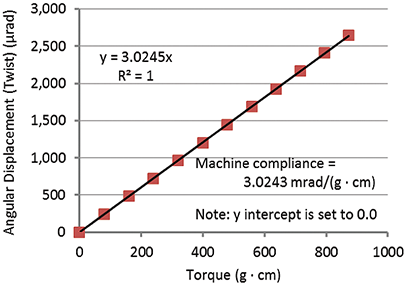 Example: determination of instrument compliance from the slope of the linear fit of the angle displacement and torque measurements. Figure 6. Equation. Storage modulus. Figure 7. Equation. Loss modulus. Figure 8. Equation. Tangent phase angle. G's = The sample complex storage modulus, Pa.
G''s = The sample complex loss modulus, Pa.
δs = The sample phase angle, radians. G'm = The measured complex storage modulus, Pa.
G''m = The measured complex loss modulus, Pa.
Jtool = The tool compliance, rad/N·m. kg = The geometry constant, m3. 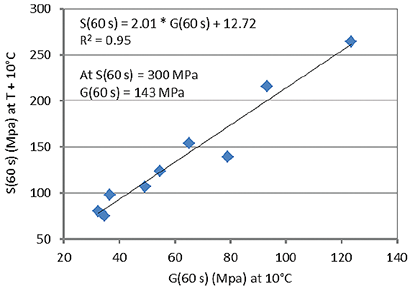 Figure 9 compares the G*(ω) master curve for a PAV-aged asphalt combining the data collected using 4-mm DSR at temperatures ranging from -30 to 30 °C and the G*(ω) master curve of the same asphalt using 8- and 25-mm parallel plates at intermediate and high temperatures ranging from 0 to 80 °C. The machine compliance corrections for 4-mm parallel plate data were done automatically by entering a compliance value into the system software. The comparison of the two master curves in figure 9 indicates: (1) the data collected on different size plates are consistent with each other, and (2) DSR reliably reproduces data using different size plates after machine compliance corrections are applied. Figure 9. Graph. 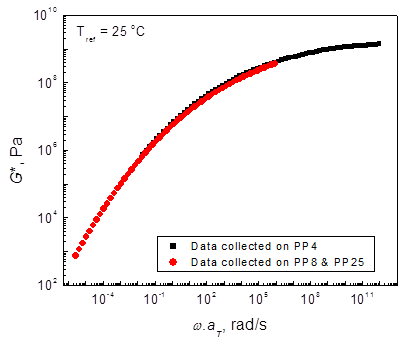 Master curves of G* combining data collected on DSR with 4-, 8-, and 25‑mm parallel plates for a PAV-aged asphalt. Low-temperature rheological parameters such as BBR m-value and creep stiffness S(t) can be estimated through a correlation with 4-mm DSR. (12) Figure 10 and figure 11 illustrate the method. 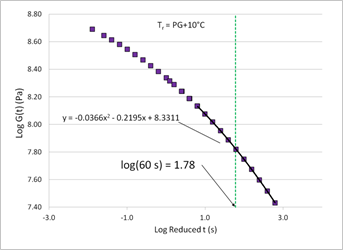 The slope and magnitude of the shear stress relaxation modulus G(t) master curve at 2 h and at the true low performance-graded temperature are correlated with the corresponding S(t) and m-values at 60 s and 10 °C above the true low performance-graded temperature from BBR measurements. Note: Reference temperature is equal to the low PG temperature plus 10 °C. Figure 10. Graph. 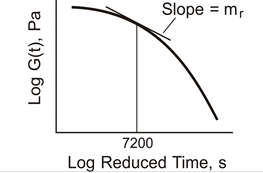 Four-mm DSR—relaxation modulus G(t) and the slope at 2 h.
Figure 11. Graph. BBR—creep stiffness and m-value at 60 s.
The method has been recently modified by measuring the G(τ) slope and magnitude at 60 s and 10 °C higher than the performance-graded temperature. (13) The reason for the modification is that it significantly reduces test time, and the test temperature is easier to achieve and reduces potential error. There are several reasons that the magnitude and slope of G(t) from 4-mm DSR were correlated with the magnitude and slope of S(t) from BBR rather than simply interconverting the dynamic shear storage and loss moduli (G', G'') to shear creep compliance, J(t), and then converting J(t) to tensile creep compliance, D(t). For example, the cooling systems used in DSR and BBR are quite different, and that can cause significant differences in the physical hardening that occurs during the respective testing. Also, to convert the complex shear modulus, G*, to a tensile modulus, E*, Poisson’s ratio (ν) is typically assumed to be 0.5 (at all frequencies). However, ν is very likely time dependent and may actually vary to as low as 0.3. Figure 12. Graph. Correlation between BBR S(60s) and 4-mm DSR G(60s). Figure 13. Graph. Correlation between BBR mc(60s) and 4-mm DSR mr(60s). 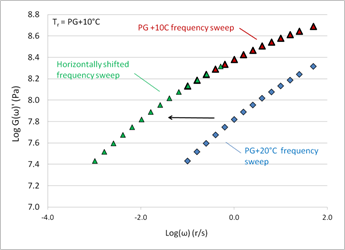 A series of steps are involved when calculating mr(60s) and G(60s) from 4-mm dynamic oscillatory shear data (two frequency sweeps in this case) at 60 s and a reference temperature of PG+10 °C. 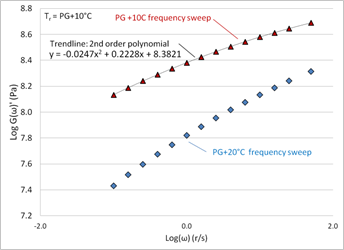 The first step is to generate a G'(ω) master curve at a reference temperature of PG+10 °C using PG+10 °C and PG+20 °C frequency sweeps. Typical test data are shown in figure 14. Figure 14. Graph. PG+10 °C and PG+20 °C frequency sweeps. The next step involves using Microsoft® Excel solver to determine the horizontal shift factor (aT) to translate the PG+20 °C frequency sweep along the abscissa so that it overlaps the PG+10° C frequency sweep. The horizontal translation is accomplished by multiplying the PG+20° C frequencies by aT and plotting the storage modulus as a function of the multiplied frequencies. The basis for the shift factor is known as time-temperature superposition. The resultant G'(ω) master curve is shown in figure 15. Figure 15. Graph. G' master curve at a reference temperature PG+10 °C. Figure 16. Equation. Shear relaxation modulus. 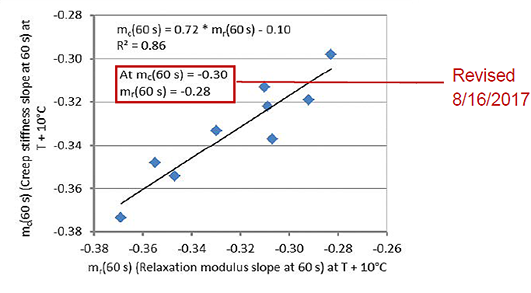 Figure 17 displays the relaxation modulus determined using figure 16. 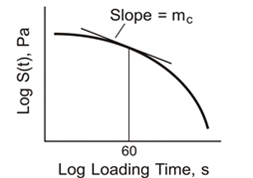 The relaxation modulus curve is then used to determine mr(60s) and G(60s). Figure 17. Graph. Relaxation modulus master curve to determine mr(60s) and G(60s). Four-mm DSR is a simple alternative to the modified BBR proposed in AASHTO TP 87-10 (low-temperature crack sealant rheology). Four-mm DSR is a simple, possibly more precise method than BBR when measuring low-temperature rheology to determine thermal stress build-up under the AASHTO R49-09. See Farrar et al. for the full report on the development of 4-mm DSR. (13) The test method in AASHTO format is available in the appendix of the report. Farrar, M.J. and Grimes, W., 2016, Asphalt Pavement—Micro-sampling and Micro-Extraction Methods, Report No. FHWA-HRT-15-051, Federal Highway Administration, Washington, DC. Hanz, A., Arega, Z., and Bahia, H., 2009, “Rheological Evaluation of Emulsion Residues Recovered Using Newly Proposed Evaporative Techniques,” TRB 88th Annual Meeting Compendium of Papers DVD. Farrar, M.J. and Grimes, W., 2016, The Universal Simple Aging Test, Report No. FHWA-HRT-15-054, Federal Highway Administration, Washington, DC. Farrar, M.J., Hajj, E.Y., Planche, J.P., and Alavi, M.Z., 2013, “A Method to Estimate the Thermal Stress Build-Up in an Asphalt Mixture from a Single-Cooling Event,” Road Materials and Pavement Design, 14:sup1, 201–211. Petersen, J.C., Robertson, R.E., Branthaver, J.F., Harnsberger, P.M., Duvall, J.J., Kim, S.S., Anderson, D.A., Christensen, D.W., Bahia, H.U., Dongre, R., Antle, C.E., Sharma, M.G., Button, J.W., and Glover, C.J., 1994, Binder Characterization and Evaluation, Volume 4: Test Methods, SHRP-A-370, Strategic Highway Research Program, National Research Council, Washington, DC. Christensen, D.W., and Anderson, D.A., 1992, “Interpretation of Mechanical Test Data for Paving Grade Asphalt Cements,” Journal of the Association of Asphalt Paving Technologists, 61, 67–116. Gottlieb, M., and Macosko, C.W., 1982, “The Effect of Instrument Compliance on Dynamic Rheological Measurements,” Rheologica Acta, 21, 90. Schröter, K., Hutcheson, S.A., Shi, X., Mandanici, A., and McKenna, G.B., 2006, “Dynamic Shear Modulus of Glycerol: Corrections Due to Instrument Compliance,” Journal of Chemical Physics, 125, 214507. Mackay, M.E., and Halley, P.J., 1991, “Technical Note: Angular Compliance Error in Force Rebalance Torque Transducers,” Journal of Rheology, 35, 1,609–1,614. Hutcheson, S.A., and McKenna, G.B., 2008, “The Measurement of Mechanical Properties of Glycerol, m-toluidine, and Sucrose Benzoate Under Consideration of Corrected Rheometer Compliance: An In-Depth Study and Review,” Journal of Chemical Physics, 129, 074502. Hutcheson, S. A., personal communication (email) with Stephen A. Hutcheson, Wednesday, June 10, 2009. Sui, C., Farrar, M.J., Harnsberger, P.M., Tuminello, W.H., and Turner, T.F., 2011, “New Low-Temperature Performance-Grading Method Using 4-mm Parallel Plates on a Dynamic Shear Rheometer,” Transportation Research Record: Journal of the Transportation Research Board, 2207, Transportation Research Board of the National Academies, Washington, DC, 43–48. Farrar, M., Sui, C., Salmans, S., and Qin, Q., 2015, Determining the Low Temperature Rheological Properties of Asphalt Binder Using a Dynamic Shear Rheometer (DSR) Western Research Institute, Laramie, WY, available at http://www.westernresearch.org/uploadedFiles/Transportation_Technology/FHWA_Research/Fundamental_Properties/Technical%20White%20Paper%20FP%2008--4-mm%20DSR.pdf, last accessed on December 21, 2016. Christensen, R.M., 1982, Theory of Viscoelasticity: An Introduction, Academic Press, New York, NY. Researchers—This TechBrief was prepared by WRI under contract DTFH61-07-D-00005 with the support of FHWA and the 4-mm DSR Technical Working Group (TWG) within the FHWA Binder Expert Task Group. Members of the 4-mm DSR TWG include Mike Farrar, TWG Chairman (WRI), Dave Anderson (Consultant), Mike Anderson (Asphalt Institute), Gerald Reinke (MTE Services, Inc.), Geoff Rowe (Abatech, Inc.), Jean-Pascal Planche (WRI), and Qian Qin (GAF). Recent additions to the TWG include John Casola (Malvern), Aadil Elmoumni (TA Instruments), Gina Paroline (Anton-Paar), Bruce Morgenstern (WYDOT), Howard Anderson (UDOT), and Stacey D. Diefenderfer (VDOT). Key Words—Asphalt binder rheology, binder characterization, asphalt emulsions.